Have you ever wondered if you might be a hoarder? Has your clutter crossed the line from untidy to out of control? For the longest time, I was worried I had hoarding tendencies. I would spend hours watching shows like Hoarders and Hoarding: Buried Alive. Watching these shows would (temporarily) make me feel better about myself. After all, my clutter was bad; but not that bad. I frantically Googled, “symptoms of hoarding disorders”. And read everything I could find on the subject. After discovering that at least two of my family members had hoarding tendencies, I began to research whether hoarding was hereditary. Disclosure: I am neither a doctor nor a licensed therapist. Please do not take the information contained here as medical advice. If you (or a family member) are a compulsive hoarder, support is available. I urge you to reach out to your family physician for help. He or she will be able to refer you to a specialist for immediate assistance. Compulsive hoarding often manifests during the childhood-teen years and progresses as you age. Quite possibly, you were an avid collector as a child, and your “collections” have grown exponentially over the years. Once a person reaches adulthood, hoarding intensifies. Likely because, as adults, we have (almost) unlimited access to stuff. Much of your stuff is useless (aka trash). While you may not think of your belongings as garbage, other’s may have told you that many of the items you possess are beyond repair, useless, or are otherwise qualified for the dumpster. The thought of getting rid of anything sends you into a panic. Your anxiety levels peak whenever someone mentions getting rid of your clutter. You may instantly experience crippling feelings of fear, panic, and anger at the mere thought of getting rid of something. Compulsive hoarding affects between 6 to 15 million people in the US. You are (overly) sentimentally attached to your possessions. A common symptom of hoarding disorder is believing that inanimate objects possess “feelings”. It’s highly possible you worry that if you declutter your possessions, you will end up disappointing them. You lack a concrete organizational system. In your home, chaos reigns. Your past (earnest) attempts at organizing the clutter have been unsuccessful. You may deny the fact that you may have a problem. Even though your friends and loved ones may have been (repeatedly) trying to tell you so. What’s the difference between hoarding and collecting? Collectors display/maintain their items. They have an organizational system in place. Hoarders lack organization. Their items seem to have “taken over” their home. You procrastinate to the point that you become “paralyzed” with inaction. All of us procrastinate to some degree. However, it becomes a concern when your procrastination regularly impairs your judgment. You own more pets than you can reasonably care for. Some compulsive hoarders hoard animals instead of objects. You may own multiple dogs, cats, horses, etc. More than likely, you lack the accommodations/finances to properly care for your furry friends. 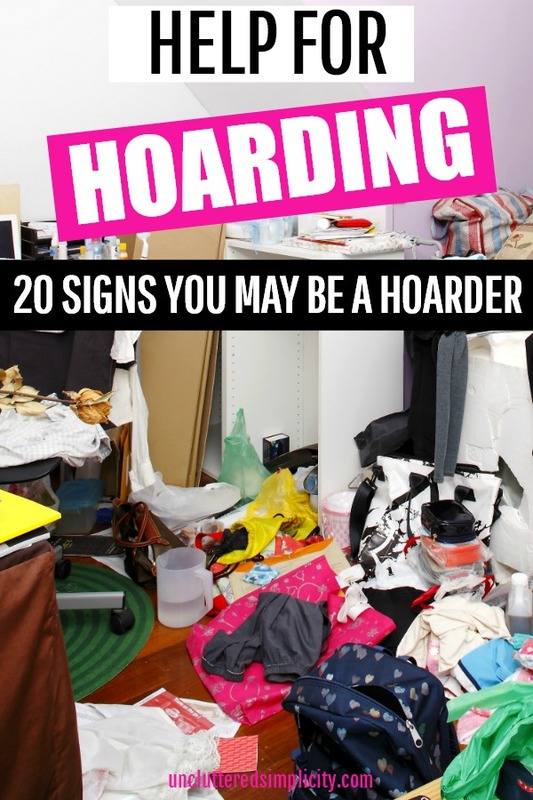 Concerned you might be a hoarder? Help is available. You have OCD (Obsessive Compulsive Disorder), an addictive personality, or you suffer from anxiety. Until 2013, compulsive hoarding was thought to be a form of OCD. It has since been classified as a separate mental illness. It’s important to note that not everyone who has OCD becomes a hoarder. Likewise, not all hoarders have OCD. Studies have shown, however, that the majority of hoarders suffer from at least one other mental disorder. At least one (possibly more) of your family members is a hoarder. While it remains unclear whether DNA plays a role in developing a hoarding disorder, frequently, a hoarder can identify at least one other family member with the illness. You are a compulsive shopper. You cannot pass up a bargain even if you have no use for the items you purchase. Perhaps you’ve maxed out your credit cards on clearance items, “limited time only” sales, or thrift store “deals” that were too good to pass up. You truly believe you might need everything you own…someday. You fear you’ll run out of an item. As a result, you may excessively stockpile soap, toothpaste, toilet paper, and underwear. Because you know (one day) you will need these items. The problem is, you cannot actually locate your stockpile underneath all of the clutter. You feel safer surrounded by stuff. Many people who suffer from compulsive hoarding have built literal walls around themselves. They are comforted being confined by their stuff. You do not want other people to touch your stuff. (And you constantly suspect that they have). You’ve even gone so far as to look in the garbage to make sure no one has thrown away your belongings. You have distanced yourself from social interaction with your family and friends. You are embarrassed by the condition of your home so you prevent others from entering it. Your “collecting” has had a negative effect on your marriage as well as your finances. In many cases, compulsive hoarding leads to increased divorce rates. In addition, many hoarders have either already filed for bankruptcy or are on the verge of doing so. You can no longer use certain areas of your home the way they were intended. If clutter has blocked your access to your bed, shower, refrigerator, or stove, it’s likely you are a compulsive hoarder. Seek immediate medical attention. Your home has become a safety hazard. Examples that a home is unsafe include water damage to floors/ceilings, the presence of mold, animal feces, and rodent/insect infestation. If your health and well-being is in jeopardy due to the unsafe conditions of your home, get help now! Thankfully, I was able to recognize and seek treatment for my hoarding tendencies early on. Unfortunately, many people do not have this luxury. If you or someone you love suffers from compulsive hoarding it is vital you implement a treatment plan before it’s too late. While compulsive hoarding cannot be “cured” overnight, treatment is available.